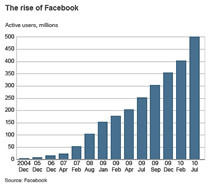 Facebook is currently the largest social network is the network with more users in Spain and around the world. Do you know these numbers on Facebook? In some countries, Facebook has equal or more web traffic to Google. Create a community on Facebook for your business, the value we give them and got to meet investment invigorate it with new customers and results (sales). We create, manage and optimize campaigns on Facebook minimizing costs and maximizing results. We offer our services with financial offers for the presence of the social network Facebook to local businesses and groups. We programmed and development solutions for applications in Facebook FBML and HTML integrated profiles and pages. Facebook growth and expansion is incredible. Are'nt you on Facebook yet?